CharyJay.com: Eden Body Works Review and "Leap Day Giveaway!" Last November I had the pleasure of receiving Eden Body Works' full line of products and I absolutely loved it! This line is all natural and affordable!! In this post I'm going to give you a run down of how I feel about each product in this line and also tell you guys about a very cool joint giveaway I'm doing with Jor-El of ManeMan.Blog.com! One guy and one girl will have the opportunity to win Eden Body Works' Hair Milk Leave-In Conditioner, which was featured in my "How to Choose a Leave-In Conditioner "video and I stated it was one of my faves! To enter the contest, read the directions below, but first let's get started on my review of each of these products in the line! This invigorating shampoo increases scalp circulation for a refreshed, renewed feeling. It removes all traces of dirt and oil build up. 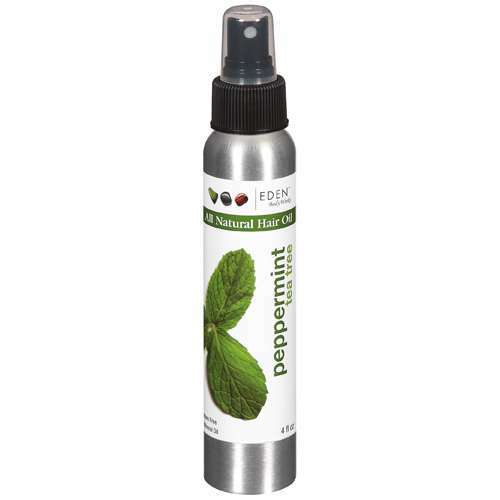 Formulated to help alleviate dry scalp with the use of pure peppermint botanicals. Your hair will love the tingle! Nourishes and cleanses, Increases hair strength & Decreases itching and flakes. I really loved this product!! So much that I no longer have any left! This shampoo did not strip my hair at all and actually left it feeling soft. I loved the tingle that it gave my scalp and it left it feeling clean without that squeaky feeling that I absolutely hate! This super moisturizing conditioner increases scalp circulation for a refreshed, renewed feeling. Leaves your hair full of body. Fortified with proteins to decrease split ends. Your hair will love the tingle! Restores moisture, Reduces split ends, Increases hair strength and shine & Adds body. This conditioner is pretty good for detangling. 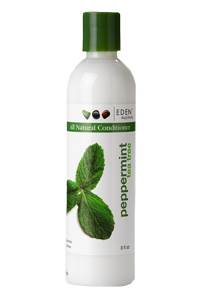 It gives an excellent amount of slip, but the smell of the peppermint in this conditioner is very powerful. When I poured it into my hand and applied it to my hair, I immediately began coughing because the scent is so strong! However, after the smell died down, I was able to massage this into my hair and begin detangling with ease. It's also leaves my hair moisturized after I rinse it out. 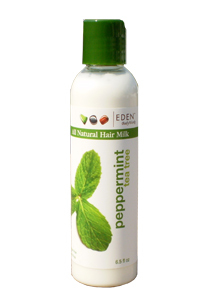 Peppermint Tea Tree All Natural Hair Milk is a leave-in conditioner formulated to boost moisture and shine in your hair, without being too heavy. Made with organic Coconut oil, Jojoba and Avocado, this blend delivers antioxidants that replenish and rejuvenate dry brittle hair, reducing split ends. Leaves your hair soft, shiny and manageable. Great for detangling tight curls. As I stated before, this leave-in conditioner is one of my favorites! It's really creamy and moisturizing. It also glides on to my hair very smoothly and feels as though its deeply penetrating my hair. It does list glycerin as the second ingredient so I hold off using it in the fall and winter, but in a few months I'll be back to using this product on a regular basis. If you want to see this leave-in conditioner in action, click here. Peppermint Tea Tree All Natural Hair Oil is an exotic blend of nourishing ingredients that penetrates the hair from root to tip to promote new hair growth without clogging pores. Made with Coconut, Jojoba and Sweet Almond oils, this unique formula naturally strengthens your hair to prevent breakage. A PERFECT CHOICE FOR HOT OIL TREATMENTS ON ALL HAIR TYPES. This product contains no mineral oil (petroleum), dyes, parabens, fragrance oil and is cruelty free.Prevents damage and breakage, Decreases dandruff and itchy scalp, Adds strength and shine, Promotes new hair growth, Leaves hair silky. 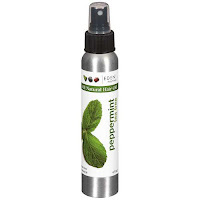 For best results use in conjunction with other Peppermint Tea Tree brand products. I just used the last of this stuff up yesterday and I was so sad! This has been my favorite oil to use! It sealed my hair the best out of every oil I own and I loved the fact that it came in a spray bottle form. The oil was able to get right into my scalp when I needed it and it was just...bliss! Yes. I loved this stuff lol. I almost shed a tear when no more oil sprayed out of the bottle. This oil is great! 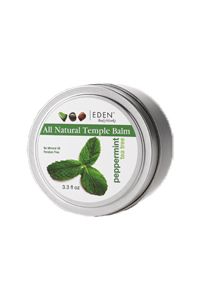 Peppermint All Natural Temple Balm moisturizes and treats your hairline to prevent weak hair from breaking, fading, or thinning out. Revitalizes and strengthens your hairline while providing a manageable hold. For best results use with other EDEN BodyWorks Peppermint Tea Tree brand products. Minimizes breakage, Adds strength, Promotes new hair growth. I used this pomade a couple times in two different ways and the results were lackluster. I first tried this out on my edges to smooth and hold down my tight little curls on my hair line while my hair was in an up-do style, but my attempt failed. This product wasn't thick enough to tame my thick hair. I then tried to use this for shine like I do with another pomade that I love. While this product did give me a hint of shine, it had nothing on my current staple so I set this product to the side. I will try this product again eventually, but for now, I have no reason to do so. 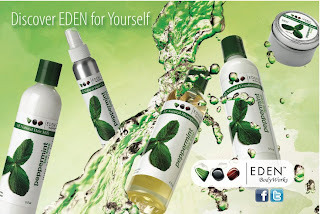 If the Hair Milk has peeked your interest and you would like to try this product, please feel free to enter this giveaway sponsored by Eden Body Works! Both Jor-El of ManeManBlog.com and I will pick a winner from our site. He will pick a guy and I will pick a girl. How cute is that? lol. So that means one guy and one gal will win one full sized Hair Milk Leave-In Conditioner. In order to double your chances of winning, get one of your guys friends to enter on ManeManBlog.com for you! While he or you are over there entering the contest, check out his site! It's a pretty awesome website for guys who have awesome fros and may need advice or support to maintain them. Hell, I'm not a guy and I still check out his website and learn some pretty cool information. I also like to check out the guys he features. Some of them are fiiiionnnne! lol. You must be subscribed to both ManeManBlog's website as well as mine. You must "LIKE" Eden Body Works FaceBook Fan page. You must answer the question: What will you be doing with your extra day this leap year? It doesn't have to be hair related, but if it is that's OK too! Giveaway ends: Feb. 27 at 11:59 EST! Q: What will you be doing with your extra day this leap year? A: Absolutely nothing! It's just another day to chill and relax with the hub, and kiddos! I will welcoming my son home from the Navy. I haven't seen him in a year! So excited for the 29th of February to come!!!! I am going to spend this extra day celebrating and thanking God for another year of life. My Birthday was on the 8th of this month and I like to celebrate the entire month!!! I am a firm believing in not planning ahead........."you wanna make God laugh, make plans", so with that being said. If the Lord blesses me to see that day, I will be giving thanks to him for that blessing and spending time with my family. Probably will make it a hair wash day also........Lol. I like the review done on these products. I have been wanting to try them but I'm so skeptical about trying products for my transitioning hair because so many have left me broke and disappointed. I would love to win this product to try out the line! this leap day will be spent with my husband, we meet on February 29th, we always say it was meant to be, b/c we were lucky to meet each other on a day that only comes every 4 years. I am going to be mini twisting my hair and hopefully catching up on some schoolwork! my newly natural hair and college homework seems like the only things I do now days! I will be in the Lab carrying out my research.